In the category SEASON, we have to consider the problems with the Asian lunar calendar and the changes to our modern times with respect to the names of months. A lot of these expressions remind of the Chinese lore and legends of old. In a worldwide context, we have to consider the differences of the Northern and Southern Hemisphere, see below. Winter is also a time when, according to the lunar calendar, the year comes to an end. The 12th lunar month was the last of the old year, time for preparations of the the New Year. ..... gentei 玄帝（げんてい）、genmei 玄冥 (げんめい）、tootei 冬帝（とうてい）、kokutei 黒帝（こくてい）"black emperor"
kyuutoo 九冬（きゅうとう） "nine winter divisions"
Please check the entries carefully!
. kannazuki 神無月 かんなづき "month without gods"
the new year is identical with the "new spring". fuyu no haru 冬の春（ふゆのはる）"spring in winter"
"spring on the last day of the year"
The 10th of the six choo tones of gagaku music. It derives from the tones of classical musik (gagaku 雅楽), which was introduced from Tang China. It was first used in a chapter of the Genji Monogatari of the "month without gods" (kannazuki, now november) and has stayed on as a kigo for winter. A common winter weather pattern mostly in China and Korea, also sometimes in Japan. 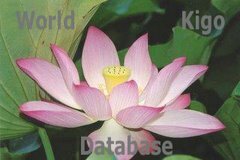 Has been introduced as kigo to Japan with the imigrants of Manchuria. This clearness and brightness is always combined with the feeling of cold in winter. The normal verb-form is saeru さえる【冴える／冱える】 . It makes us feel happy and bright about the cold. It reverberates in a cold winter forest or over a field. Especially cold on the last night of the year, ringing in the New Year. If there is not specific mention, a calendar reference kigo refers to the Northern Hemisphere as its place of origin, since haiku and the saijiki concept originates in Japan.
. zud dzud (зуд) snowy winter . Most of the heaven phenomenon have their own entry.
. kigo which relate to cold winter weather .
. Great Cold, daikan, taikan 大寒 . This is a word in the dialect of Northern Japan and Hokkaido, when the winter days get really cold and freezing, even during the daytime. yuki no sei 雪の精（ゆきのせい）"spirit of the snow"
a kind of monster of Japanese legends. 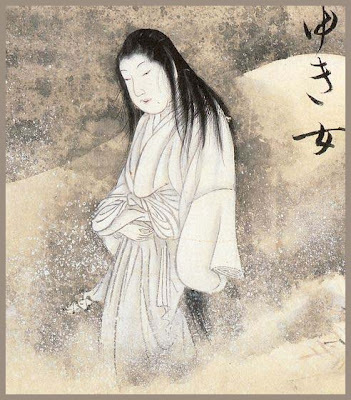 It might also be the "fairy of snow", so to speak, the personification of the soul of the snow, for the Japanese reader. She is often seen on full moon nights and around the New Year. Some say this expression refers to a particular physical quality of the snow of Northern Japan, when the conditions of humidity, coldness and moonlight are just right.
. Legends about Yukionna and 雪婆 Yukinba .
. Nakamura Sakuo, 2008 . The LINKS to further kigo are given here.
. tsuki kooru 月氷る（つきこおる）"freezing moon"
fuyuyamahada 冬山肌（ふゆやまはだ）"skin of the mountain"
no, nohara 野原 refers not the the planted fields, but to wild fields and plains, sometimes also translated as moors. yasumeta 休め田（やすめた）"paddy taking a rest"
mizu kemuru 水烟る（みずけむる）"water is smoking"
These are two saijiki of their own ! . . . . Observances, seasonal events, rituals . . .